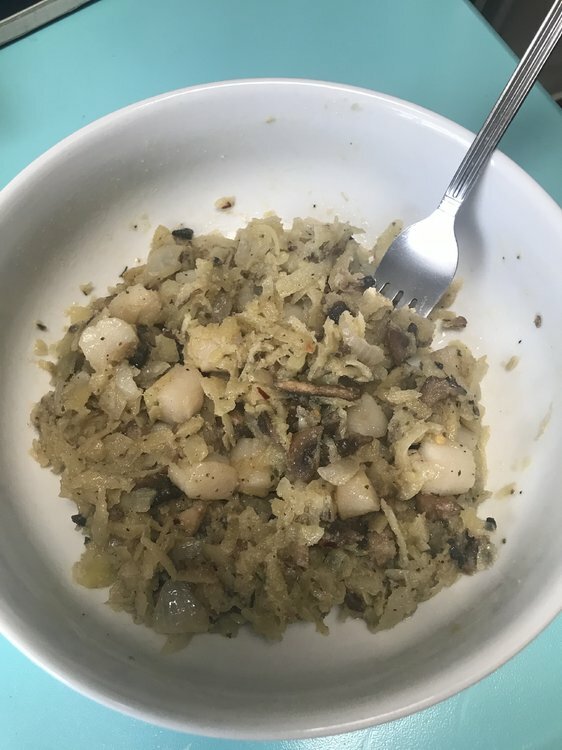 Potatoes prepared & cooked this way (except w/ olive oil instead of butter): https://www.allrecipes.com/recipe/220520/classic-hash-browns/, then added to sauté-ing finely chopped mushrooms & onions (cook in pan for 4-5 mins on medium heat before adding potatoes). Then added ~1/4 cup coconut flour (for funsies to see if it would add good texture; it did! But do so only if you like the taste of coconut, else perhaps try another compliant flour), then added pan fried bay scallops (I'm sure there's good instructions online, but I just winged it; ~5 mins on medium-high heat, flipping a few times). All seasoned with salt, black pepper, & red chili pepper flakes (add only if you like spice)!